Standards in lighting and interior design are changing the same as standards in the fashion world. However, you do not have to blindly pursue the seasonally changing trends, provided, however, that you skillfully choose the kind and way of lighting in your interiors. Lamps do not have to be just a background to other furniture and equipment. If you want to enjoy wonderful lighting for many years without having to replace it in a short time, it is worth to put on a simple, classic look. It may apply to both selected materials and shapes. Deciding on raw materials, we can bet on the original and slightly more extravagant design lamps, which in general expression, in a non-recipe and non-interspecific, will reign over the entire room. At this point, it is worth taking a closer look at the arrangement possibilities that metal lamps offer. Individual solutions will work great in apartments arranged for industrial style, but also Scandinavian or glamor. Hanging lamps are the basic and, at the same time, the most important type of indoor lighting. Due to different ways of light scattering and the richness of models available on the market, the choice of the right one is not the easiest one. 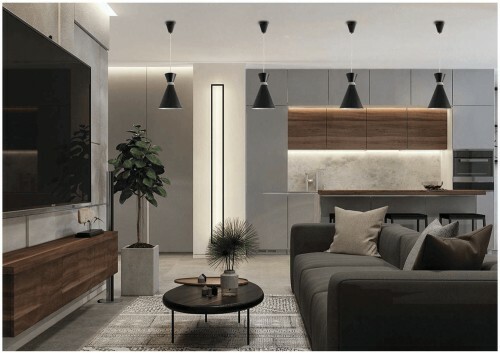 At the beginning you should strictly determine the place of assembly of the lamp (if you have such a possibility, it is worth paying attention to at the time of designing the house and electrical installations), others because you choose the dining room along the table, and others in the spacious living room. Hanging lamps usually play the role of functional and decorative lamps, rarely only decorative ones. When choosing lighting for the kitchen, pay attention to two different functions that must be fulfilled in this room. The first of these is the general scattering of light. It is important to allow the reflection of light from the walls or ceiling, which prevents the creation of undesirable shadows on kitchen cabinets and ensures even illumination of the entire room. As a standard, in a flat with a height of 2.4-2.5 m, the height of hanging lamps should be at the height of 1.9-2.1 m. The kitchen is a place where you should choose a lamp with a wide metal shade, which should also find high up against the ceiling. The second important role is lighting the worktop, which should be located 0.55-0.7 m from the light source. It is worth remembering the practical aspects and choosing a lamp that will not be problematic in cleaning - simple metal lamps are a great solution (designer lamps with a large number of holes are not recommended). A different situation is in a room such as a bedroom, if you want to create an intimate atmosphere in it, it is worth choosing a shade in the form of a hemisphere that will close the beam of light and focus it in one place. If you want to arrange a stylish bedroom in the style of glamor, choose a lamp that will imitate precious materials, such as gold or copper. Perfectly here in its original shape. Metal hanging lamps are an ideal solution also over night cabinets, instead of traditional standing lamps. When deciding on a lamp in the living room, pay attention to its size. If it will be the only source of light, it is worth choosing a large shade, which will not limit the light scattered significantly, or simply a metal openwork cover (a well-lit salon will optically enlarge it). Otherwise, you can choose a lamp that is a decorative function, and complete the whole with sconces and floor lamps. The aforementioned sconces are an excellent option for all those who want to further light up the room. A room with a small area can gain a bit more space in the eyes of an observer, thanks to wall lights illuminating one of the longer walls. Sconces can then be selected to the rest of the apartment, or opt for subtle metal shades, focusing only on their functions. Deciding on the Scandinavian style in your apartment, without hesitation, you can bet on lamps in white and black, which in their simple forms are characterized by a unique aesthetics. Classic, closed shades never go out of fashion, and enriched with white and black colors, unify the whole apartment in a stylish and unique way. It is worth choosing a series of lamps in each room, for example a large white in the center of the living room and a few smaller ones in black, mounted on a slat in the dining area. Maybe you will be interested in products from these categories?